If you somehow have missed it, you can buy an OLPC laptop for yourself or a kid in your family, and you'll at the same time be giving one to a child in the developing world. All for $399. If I were in the US, I'd do just that. The offer has been extended to the end of the year. You go here: Give One Get One. The mission of One Laptop per Child (OLPC) is to empower the children of developing countries to learn by providing one connected laptop to every school-age child. In order to accomplish our goal, we need people who believe in what we’re doing and want to help make education for the world’s children a priority, not a privilege. 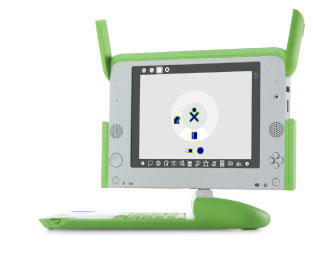 Since November 12th, OLPC has been offering a limited-time Give One Get One program in the United States and Canada. During Give One Get One, you can donate the revolutionary XO laptop to a child in a developing nation, and also receive one for the child in your life in recognition of your contribution. Thanks to a growing interest in the program, we are extending Give One Get One until the end of the year. You also may donate laptops via our Simply Give and Give Many options. Though the increasing public interest in OLPC, we hope to give many more children the opportunity to grow, explore, learn and express themselves. Interesting timing that you would send a reconnect notice to me via NCN. I'm on the Board of Earth Treasury (earthtreasury.org), and we are planning to sell and support the XO computers as part of our overall mission. We wonder, beyond the one unit you want, what the market might be in your neck of the woods. You really should test your links from time to time. I've found that some are no longer valid. Please revise and update. Thank you! A few of us have even acknowledged that discourse might be driven by the instructor and a couple of intelligent understudies. In the event that this sounds natural, then read on, in light of the fact that it doesn't need to be that way! So true. Honesty and everything redzeniogc.